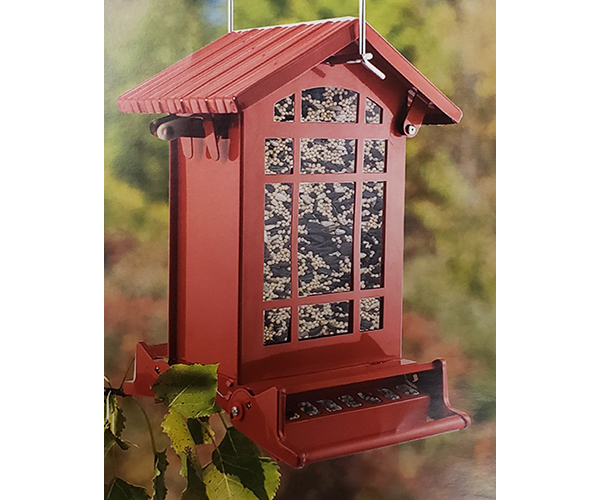 The Chateau Squirrel-Resistant Bird Feeder is a two-sided vertical seed feeder in a compact, functional design that is loaded with features. The sturdy steel Chateau style design and rich red powder coated finish makes this a songbird destination! Large capacity holds up to 7 lbs. of mixed seed with a No-Waste seed saver baffle to prevents lost seed and nuisance birds. The weight spring-activated perch can be adjusted for desired bird types and to deter squirrels access. Hinged lid for easy filling and sturdy steel rod for hanging.